The most successful brands know Search and Digital Marketing is key in driving awareness and capturing the intent of consumers. We’ve helped brands across Finance, Automotive, Retail, Telecom and various other verticals reach their marketing and business goals. What stays the same, time and time again, is our commitment to finding surprising, data driven solutions that actually make a difference. A retail client faces a unique challenge in paid search advertising efforts as they compete in the generic space against e-commerce enabled retailers. To expand on awareness based campaigns, we wanted to further assign value to paid search campaigns, and optimize towards a quantifiable KPI. 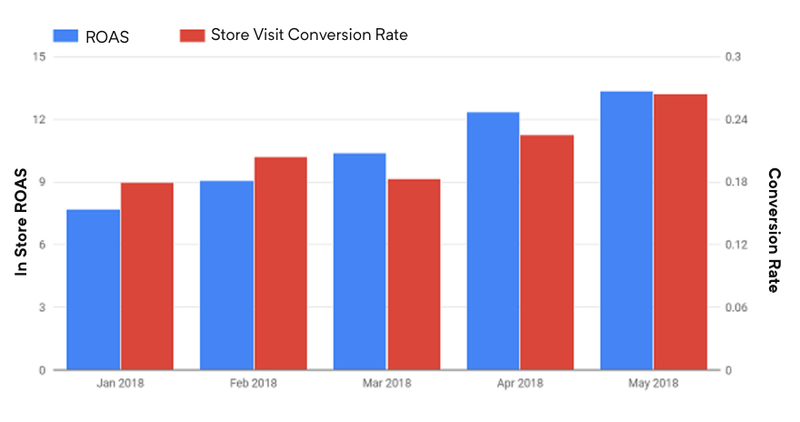 We implemented Google store visit conversions and paired them with in-store sales data to develop a ROAS model specific to paid search activity. This led to a shift in KPI, from CPC for site visit, to CPC for store visit. After a short data collection period, we began to implement bid by distance and device modifiers to optimize toward store visit conversions. A custom formula column for ROAS was built into the data studio dashboard for full cycle reporting from click to return. A shift in KPI prioritization allowed us to think differently about how to optimize against store visit conversions. By analyzing the bid by distance performance data, we were able to determine that searches from 1-5km from each store location were top converting. Bid adjustments were made accordingly to drive an overall increase in store visit conversions and ROAS. In a competitive, fast paced digital environment, a financial services client was looking to promote their mobile app, offering ease of banking to their customer base. After running a seasonal Universal App Campaign (UAC) test, the client was looking to continue to drive app installs while maintaining or reducing cost per install. Moving away from seasonal Universal App Campaign activations, we implemented an always on approach. Data from previous UACs was leveraged to define a cost per install guardrail of $6.00. Optimizing against an always on app campaign drove a 303% increase in app install conversion rate, and a 58% decrease in cost per install, falling well below the $6.00 guardrail. As a next step, we have recommended incorporating video assets, which on average results in an additional 16% increase in conversion rate. National restaurant chain chooses Saatchi after multi-agency pitch. Quesada Burritos and Tacos has chosen Saatchi & Saatchi Canada as its agency of record, after a multi-agency pitch. Quesada was looking for an integrated agency to increase restaurant sales, guest count and brand recognition over the next few years. Saatchi responded with an integrated approach that included everything from the broad strategic positioning of the company, communications planning, right down to the way Quesada could optimize their performance with online ordering apps. Client and agency are currently in the planning stage, and their first campaign together is expected in late 2018.